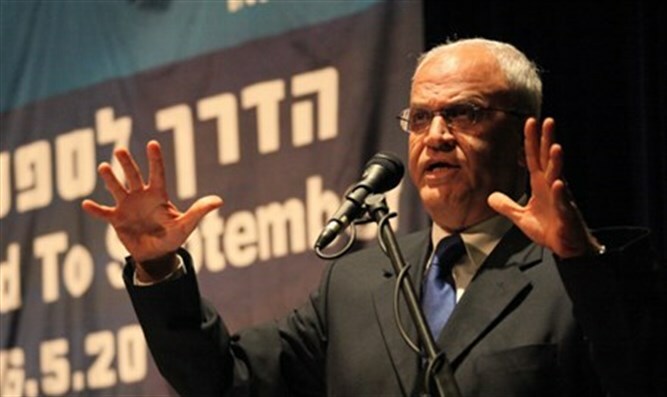 Saeb Erekat to continue to lead negotiations with Israel, decides Fatah. Also appointed: A deputy to Abbas. The Fatah Central Committee decided on Wednesday that Saeb Erekat will continue to lead negotiations with Israel, despite the fact that he has several times in the past expressed his desire to leave the role. Erekat, who is also Secretary-General of the Palestine Liberation Organization (PLO), has upped his rhetoric against Israel in recent weeks. Two weeks ago he called on the International Criminal Court (ICC) in The Hague to open an immediate investigation into “the crimes of the occupation", particularly the “crimes of the colonial settlement of the occupied Palestinian land, including East al-Quds." This week, he called on the European Union (EU) to impose a total ban on products form Israeli communities in Judea and Samaria. Also on Wednesday, the Central Committee for the first time chose a deputy party leader, Mahmoud Al-Aloul, to serve under Mahmoud Abbas, according to Reuters. It was unclear whether Aloul would also be the favorite to succeed Abbas as chairman of the Palestinian Authority (PA). Aloul, for years a close Abbas confidant, served as governor of the Shechem for 10 years and as the official in charge of labor but he is not the deputy leader of the PA and is therefore not seen as a certain successor for Abbas. Aloul was a commander who led Fatah forces that fought Israel in Lebanon and were responsible for abducting eight Israeli soldiers there in 1983. A third appointment on Wednesday was that of Jibril Rajoub as Secretary of the Fatah Central Committee.